At first glance, India's model city seems un-Indian. In place of the usual urban chaos and clutter, Chandigarh's traffic circles move vehicles smoothly through a fan-shaped grid set in vast parklands. Where other towns boast tall and impersonal boxes of steel, Chandigarh celebrates the handmade feel of low-rise complexes sculpted in brick. There's practically no neon. Numbered housing "sectors" are egalitarian, the setting almost too tranquil. Just as views of its Himalayan foothill backdrop remain sweeping, the scale is tenaciously human. When Nehru chose the visionary Swiss architect Le Corbusier (both pictured above) to take over the creation of a new capital for the divided Punjab in 1951, he intended for Chandigarh to be a statement of innovation for a nation where material progress would be wedded to ancient values of simplicity and rootedness. With the breathtaking concrete edifices of the Capitol Complex moldering behind security sandbags  in dire need of applied-for World Heritage protection  and inner-city plazas looking more abandoned than avant-garde, Chandigarh is now more of a showplace destination for a global stream of aspiring architecture students. The world still waits for that "era of harmony" Le Corbusier promised to advance here. Yet time's passage has proved wrong those critics who question the city's Indianness. Today, the city is threatened by its very success, as Indians have been lured here in droves by its relatively high living standards and high percentage of greenery. An old vision of modernity is being replaced by the latest model: IT companies, theme parks, health hubs, golf courses and too many luxury cars. 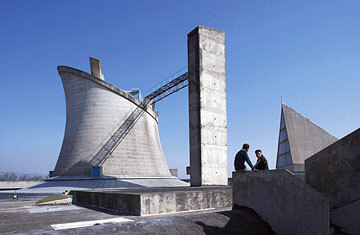 But Le Corbusier has left behind more than iconic buildings and earth-colored shopping blocks. Chandigarh is still the place to ponder what rational planning might have done and still can do. In a continent of mindless growth, it is the thinking man's city.